Keene 6" gold dredges are used by many professional gold dredgers. Once you are into the gold it is the volume of gold bearing gravel processed that decides whether an operation is profitable or not and a 6" moves the volume! The 3-stage sluice offers enhanced fine gold recovery, and the more hours you operate, the more important this will be. Keene 6" dredges of course feature their oversize powerjet with quick coupling system. This dramatically reduces clogging and in the rare event of a clog, allows for quick and easy access to the hose. Keene "Mini" 6 Inch dredges include marlex floats, 3 stage sluice, non-clogging jet system, air compressor, and 20 feet of suction hose. This 6 inch line of dredges are for the serious gold prospector, or even the professional, requiring portability and performance. Increased suction power will pull rocks from over a foot away and moves a tremendous amount of material. The dredges are quipped with the 3 Stage sluice box that will astonish you with the amount of fine values that you will recover. 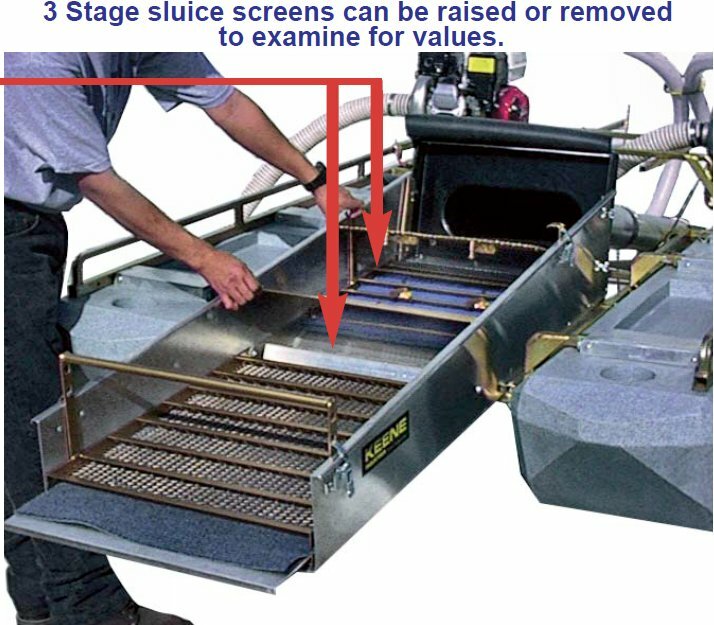 Quickly determine at a glance if your gravels contain values on the new black rubber matting located at the front of the sluice. The 6211M features twin Honda GX200 5.5HP motors with Keene P180 pumps and T80 air compressor for a diver (optional dive gear required). 3 Stage Sluice Box is the ultimate in fine gold recovery, convenience and easy clean up. Honda motor and pump combinations for durability and fuel efficiency. 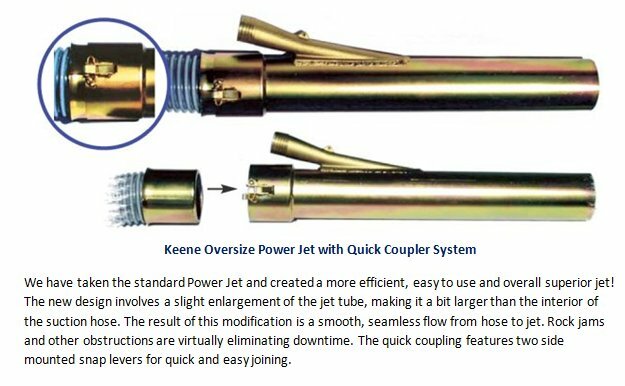 Non-clogging jet system with quick-release hose coupler. Floats with step nose cut and runner bottoms for sliding through fast rocky rivers. Storage indentures in floats provide a place for your tools, mask, rock pick etc.